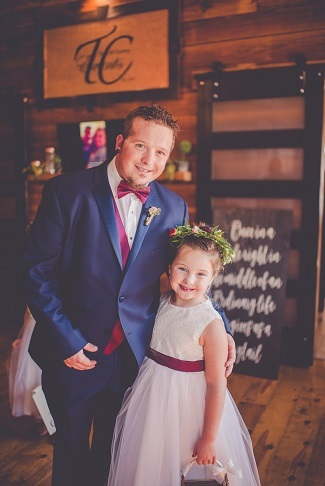 Ashton and Jessica’s wedding will always be memorable for all the thought and details they put into their special day as well as Jessica’s delightful excitement and enthusiam over her wedding flowers which was infectious!! 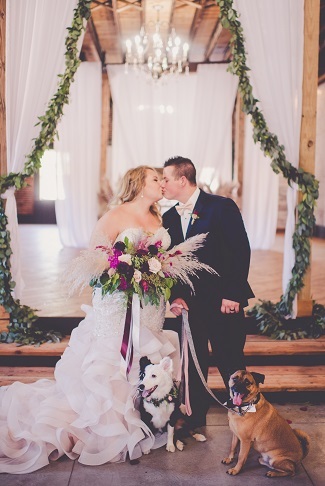 They were married in September at the lovely venue “Town and Country Events” in Milford, IL. It was our first time to deliver there and we found it to be charming and thoughtfully arranged with a very helpful staff. 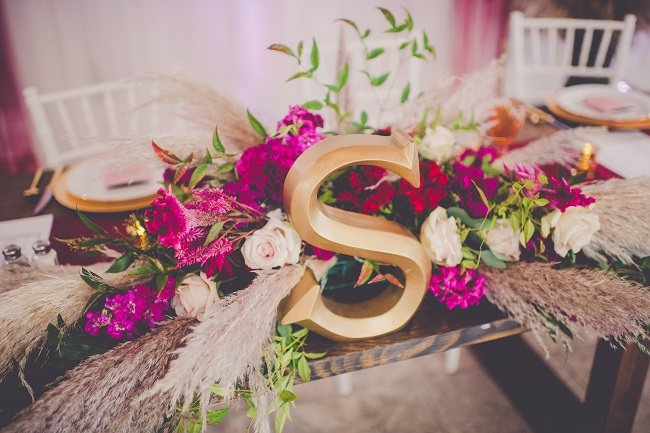 How did you come up with the theme for your wedding decor? We wanted something that was simple, gorgeous, would photograph beautifully and also be so different it would be breathtaking. 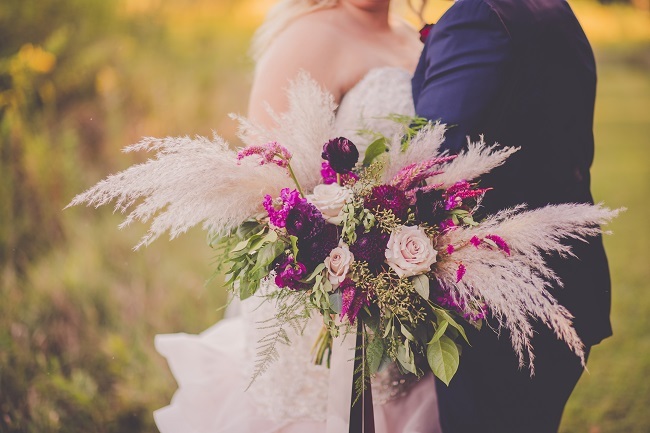 We wanted a WOW factor for the florals which is why we chose to incorporate Pampas grass. 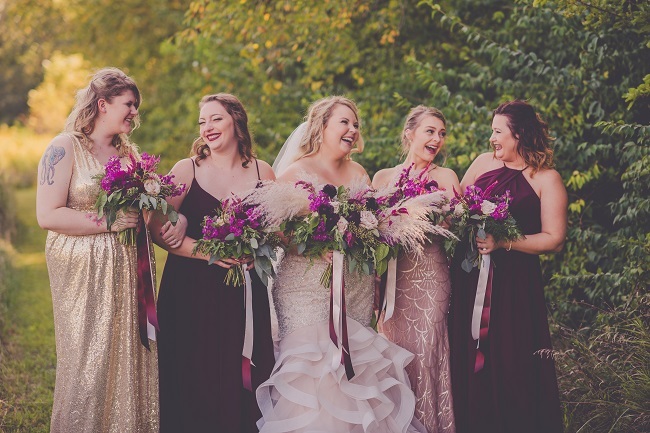 So many brides are doing blush and burgundy palettes these days, we decided to mix in magenta blooms to the bridal bouquets and ceremony floral decor to make it different and bring everything together for a beautiful pre-fall wedding color palette. We followed suit with our color/brushstroke theme with a trendy new cake design we saw on Pinterest and we also found a calligrapher who hand painted paper goods which tied everything together simply but gorgeously. All the details! 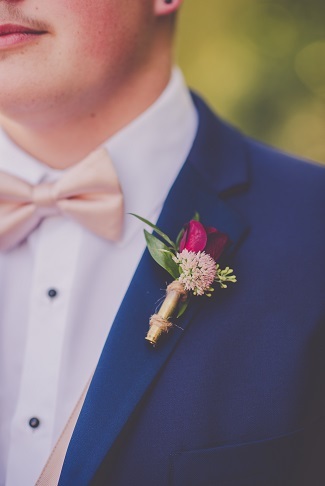 Anyone can plan a wedding, but it’s the details that make it so special! We had our dogs included – they are our fur babies and part of our family. We did voice-overs for our first dances and kept our parents included through the whole night. We wanted to share with the people who have been with us through every aspect of our lives and who have shaped us to be the people we are today. We used lace from my mom’s wedding gown on my wedding bouquet handle along with my great aunt’s pearls. I used the remaining lace on handkerchiefs for my mom and grandmother along with a message from me. Having a part of my mom’s wedding passed down through my wedding to the women who mean the most to me was so special! We displayed family photos, some dating back to 1903, helping to remember those who had passed before but knowing they were with us. I created priceless moments with my mother-in-law as we made the hand-lettered signs, shirts and personalized details for our wedding. The details are what meant the most to me and I will always cherish the memories! What part of wedding planning did you find most difficult? I found making and organizing the crafts the hardest as it was so time consuming. Every weekend we had a project; between staining boards, making shirts and gifts, I was one busy bride! My in-laws can make anything and they helped make our unity board. It was a story itself with staining the boards, gluing them together, and getting them stuck to the board we laid it on. I am happy to have those memories and every time I look at the board, I smile and remember how hard it was to make but love what it symbolizes. Do you have a favorite memory from your wedding day? A memory that stands out the most to me is hearing Ashton’s vows. Neither of us knew what our hand written vows entailed, however when he shared them with me on the big day, it baffled me how similar they were to mine. Like I had shared in mine, God had been writing our love story for 20 years. He had always allowed us to share the same childhood memories, at the same places and experience the same things even though we had never met but there were so many times that we could have! I had drove by his parents house every time I went to Bourbonnais and never knew how much that house would now mean to me. Back then, it just wasn’t our time – then one random night God knew it was our time and it has been history since. God has put us through many tests in those 3 1/2 years, but he has always answered our prayers every step of the way. What advice would you give newly engaged couples just starting to plan their wedding? My advice would be to start planning right away – the engagement goes so fast! We were engaged 1 1/2 years and it flew by. The BEST vendors get booked up so do your research and get those vendors booked – don’t settle for second best and think outside the box! We had a dream of a team of vendors and it made the process so easy! We knew what was most important to us as far as what we wanted to splurge on. We knew gorgeous photos and flowers were a must. 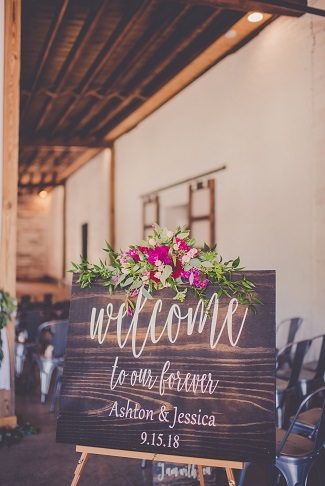 With beautiful photos, you will forever have those memories and we are so happy with Kara Evans Photography as she captured everything. The wedding flowers really make the venue space come to life. 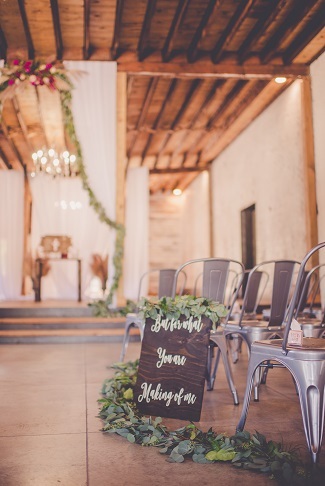 We re-used everything from the ceremony for the reception which is something to keep in mind with the decor. All the ceremony garlands were placed on the reception tables and the floral sprays were moved to decorate the head table. Nothing was used only once. Happy Wedding Planning!! What did Jessica say about her experience with Fancy Florals By Nancy? I found Nancy through The Knot. I didn’t know many florists back home. I met with Nancy and we discussed the vision for this wedding. 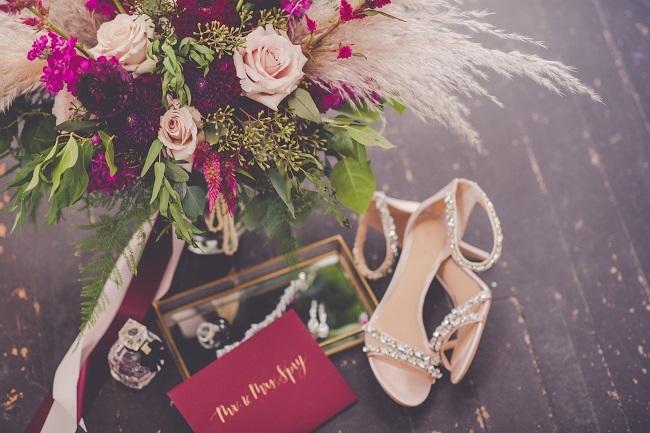 My colors were burgundy and dusty rose, but we didn’t want to do the typical burgundy and blush flowers. She had me so excited when I sneaked out to see the wedding flowers and bridal bouquets when she was setting up for the wedding. 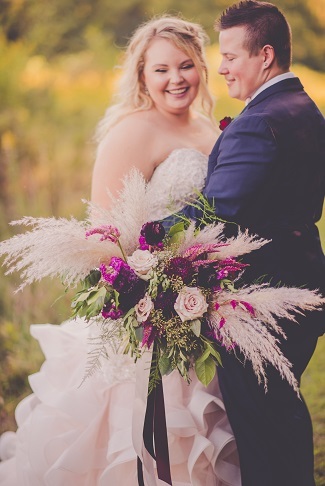 She had fuscia and magenta, dusty rose and burgundy flowers with greenery and pampas grass! So beyond gorgeous! She did garland and floral sprays for our ceremony that were just breath taking! She also did flower crowns for our flower girls and a flower collar for our dog. The bouts were made out of shot gun shells my husband and groomsman shot. We kept everything so unique and simple at the same time and she blew me away with how gorgeous everything was. To the ribbons on the bouquets, and using my mother’s wedding dress and Great aunt’s pearls as well. I couldn’t imagine anyone else making our wedding so gorgeous! Thank you so much Nancy! Become our next satisfied client!